왜 금융 공룡들은 커스터디 시장에 진출하는가? 증권형 토큰 Security Token 과연 정답인가? March 8th, 2019, Seoul — ICON has released its own token specifications for 3rd-party market players interested in developing and commercializing blockchain-based assets and securities. 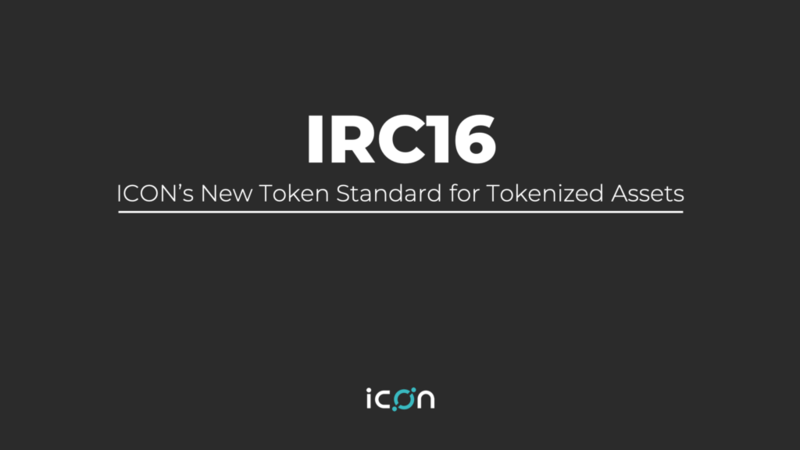 IRC16, a newly added token standard based on ICON’s public blockchain network, is designed to allow transparent issuance of tokenized assets and securities. Also, it supports simple tokenization of various physical assets through a modular architecture for built-in compliance with legal regulations related to asset ownership and transactions. Tokenization of real assets, which divides, proves ownership, and allows for the sale of physical assets into smaller ‘token’ units, is expected to increase the liquidity of high-value assets and expand the size of existing investor pools over the long term. Additionally, smart contracts act as intermediaries guaranteeing the settlement of asset trading between sellers and buyers, thereby simplifying the transaction process and minimizing brokerage fees. The process of reviewing and signing contracts in the existing offline environment is instead handled online through smart contracts. Focusing on regulatory compliance, ICON’s IRC16 features four functions: Check for Token Transfer, Token Control by Operator, Document Management, and Partition. As the legitimacy of issuing tokenized assets and securities is especially emphasized, ‘Check for Token Transfer’ function provides an interface that verifies whether token senders and recipients passed know-your-customer (KYC) and anti-money laundering (AML) procedures, and limits the number of investors that can initiate and receive token transfers. This feature also provides the reason for failure if the token transfer fails. ‘Token Control by Operator’ supports compliance with regulations regarding fraud or the loss of personal encryption (private) keys. ‘Document Management’ stores and manages relevant legal documents to ensure that the rights and obligations of token issuers and investors are observed. ‘Partition’ allows for partially fungible tokens, which allow issuers to attach metadata, including lock-up periods, to be built into a certain portion of the tokens. . Meanwhile, the ICON project’s development roadmap, including IRC16 specification updates, can be browsed on the website (https://icon.foundation), while the IRC16 source code can be found on its Github page (https://github.com/icon-project/IIPs). ICON adds a token specification to support the development of tokenized securities was originally published in Hello ICON World on Medium, where people are continuing the conversation by highlighting and responding to this story. 네 분석리포트는 분석리포트 아래 첨부되어있는 링크를 통해 확인하실 수 있습니다. © 2018 hexlant. All rights reserved.